By Alvaris Falcon in Desktop. Updated on December 14, 2017 . The world is going to be shaken again as on the yesterday, Apple released the developer preview of its next major update for the Mac Operating System, named as “Mountain Lion” (download its theme wallpaper!). Apple did really live up the Mountain Lion’s quote, “Inspired by iPad, Re-imagined for Mac”, by integrating most bundled iPad-specific apps to the Mac, and Messages is among the top 10 features of the latest update. Judging by its name, the application should function like the iMessages in the iDevices like iPhone and iPad, but it is more than you thought. The new app, which could be treated as the predecessor of the iChat, has seamlessly combined both awesome features of iChat and iMessages to provide you a better messaging experience on the Mac. Today, right after the release of the Messages Beta, we feel so motivated to walk you through every essential feature that the Messages offered for you, along with some extra tips and tricks on using and manipulating the features. While you could download and experience the Messages Beta directly, have a fun time on understanding and exploring its features through this article! It’s really fun to see that after the installation, you will be seeing a similar interface which you will remember that it appeared on your iPad and/or iPhone: it’s iMessages’ interface! However, once you really play with it, you will realize that it’s not just a simple iMessages, but a powerful application with all major features of iChat integrated into it. So you’ve probably got it, you could enjoy what you have enjoyed in the iChat: You could still own and create the Buddies List, do a video chat with your buddies, share your screen, and all the essential stuffs you have done in the iChat! It’s not just about the features of iChat, but tiny yet awesome features from iMessages as well, for example you could see a message bubble popping up when you or your friends are typing. Also you could send your message to multiple friends by just acting like you’re using iMessages: press on the New Message button, then select contacts, write the message and deliver to all of your selected contacts! So you don’t absolutely need to miss your iChat, it’s here, and with the merge of iMessages, it is now stronger than it was before! When you took a first glimpse on the Messages, you might be thinking the same way as I thought: “Now I can receive messages even I’m on the Mac!” Yeah, with the Messages app on the Mac, you will no longer need to move every single time from your Mac to the iPhone, just to see, maybe, a trivial message from your friend. But that’s not the most awesome point of this application. What’s really awesome is, now you could send the messages from your Mac to your clients or co-workers who own the iPhone, and unlike those instant messaging apps, they will receive the message even when they’re on the move! Think carefully, there’s really no application on the computer or laptop that achieves the same convenient way that Messages did! 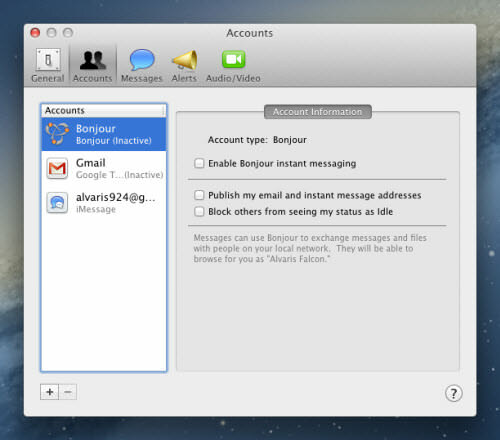 Furthermore, if you are like me, who loves to do as many things as possible in the same application, here is one trick for you: with Messages on your Mac, you could just send any idea or thought from your iDevice’s iMessages app to your own Apple ID, and it will be delivered to your Mac right away, even if the Mac is turned off! You don’t even need to open a note taking app just for taking a quick note! 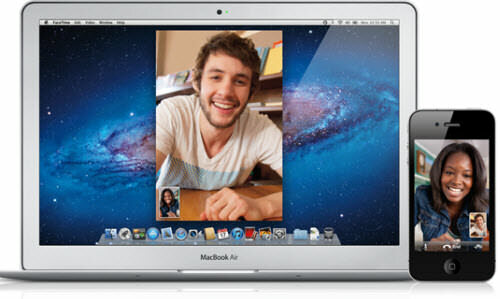 It’s not just about chatting anywhere physically, but also chatting anywhere virtually. Think about it. 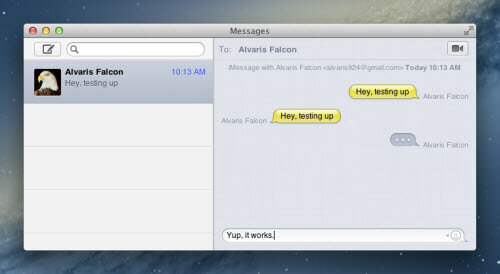 In the past time you could only send messages between iMessages using the iDevices like iPad and iPhone, but now the Messages allows you to connect with your friends using other instant messaging services, which are AIM, Yahoo!, Google Talk and Jabber accounts! 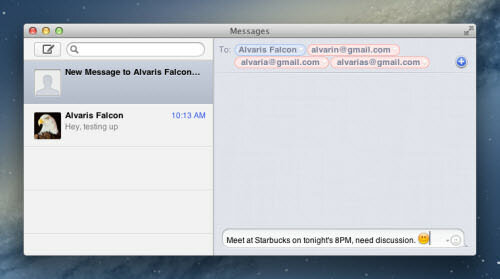 So Messages is not probably what you might think of, a dedicated app for the message trade between the Mac and the iDevices, but it can also import contact, and engage conversation with your contacts on other instant messaging apps as well. However, be noted that the group chat and file sharing feature might be disabled on certain instant messaging service, such as Google Talk. 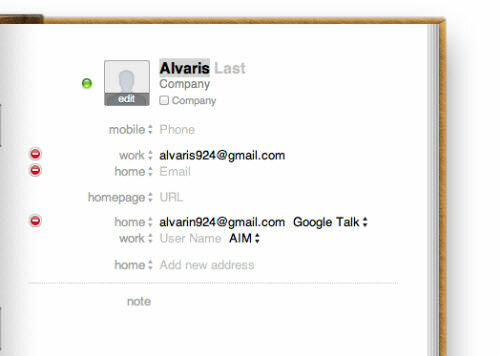 You can always view the account’s capabilities by right click on the contact, and select “Show Info“. You could definitely do more than what you could think of when you first saw the listed features of Messages, and I found this statement very true to the sharing capabilities of the Messages. In the nearest past you could only send text, image and video between the iDevices, and now with the Messages deployed on the Mac, the game is changed: you could send any file with any format to your iMessages app in the iDevices! As usual, it’s really easy to share a file on Mac, you just need to drag and drop the file onto the chat window, message box, or the contact’s icon, that’s it! File sharing between instant messaging services is quite normal, but this feature is extremely helpful when you’re on the move, and the sender does not have file sharing application, such as Dropbox installed on his Mac. Instead of asking and lecturing him to download and install the file sharing service, you could just inform him to drop the files into the Messages. 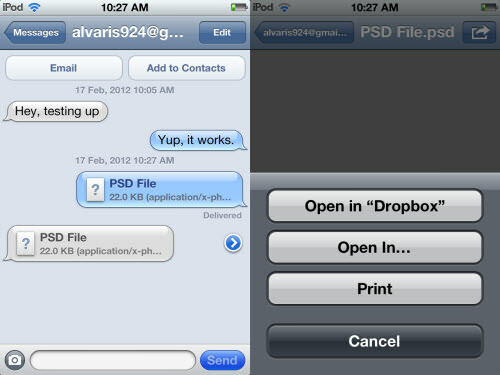 Aside from the usual benefit that you can receive the file through the Messages on your Mac, you could also receive it through the iMessages app on your iDevice, which you could later view them with iMessages or other app, or even upload them to the Dropbox app anytime for future access on any device with Dropbox installed! It is important to note that the Messages does not have the FaceTime installed into it. That probably means that you will still need to launch the FaceTime app when you want to do the FaceTime with your friend. I think the FaceTime button is existed on the Messages’ interface for the case that you want to do video chat with your friends, but they only own iDevices, so you just need to click on the button to initiate the FaceTime with them, instead of wasting one more icon space on your docking bar. Also with the FaceTime integration in mind, Messages will also record down your contact’s phone number, and try to track if the person’s device has the capabilities of doing the FaceTime calling. Nevertheless, you could still do the regular Audio Chat or One-Way Video Chat by right click on the contact and select the option, since these features are well-inherited from the iChat. When you add new contacts over time, you will definitely notice that different contacts from the same person will fill up your Contacts window eventually, and it causes the contact browsing confusing and suffering as well. The good news is that you can combine all of the person’s contact into one profile through the Address Book. To combine and arrange the person’s contact, you just need to click on the “Window” from the application’s menu bar and select “Address Book“, then click on the contact’s profile and input the email address for each different instant messaging service. By that way, Messages will combine all the contacts into one distinctive profile, and whenever you message with the person, the bottom part of his message will show the instant messaging service that the person is currently using. Sleek and intuitive, isn’t it? Drawback? There’s no really a serious drawback so far. Though Messages is a combination of two complete and distinctive products, their features work really well with each other, except the fact that the product is still in its Beta version, so expect to see some bugs and weird naming as well. Also, though it’s not a bug, when your friends communicate with you though Messages, your device would continuously generate the regular notification “beep” sound, which is kind of annoying. We haven’t find out a solution so far from the Messages’ preference, but Apple should be doing the workaround to solve this issue, since many complain about that. If you want to convert to Messages Beta but you’re worried that your iChat will be removed forever, fear not, as Apple cared about your comfort. For now, you could revert to the iChat anytime you feel the Messages Beta is uncomfortable by click on the “Messages” on the application’s menu bar, then choose “Uninstall Messages Beta” to revert to the iChat. So try it anytime you like without even fear to losing anything! And be sure to let us know which Messages’ feature you love the most, and possibly what you think about the Messages!